Comprising video, painting, and drawing, these works reflect the interdisciplinary nature of my art. Mediums I have been engaged with separately in the past are brought together (sometimes literally) to create a diverse body of work. The works move between the personal and the political, and between a controlled, thought through technique and an expressive one. “Controlled explosion" is the name of an actual police or armed forces procedure used when a suspicious object is left unclaimed in a public space. Growing up in Israel, I witnessed several of these procedures, in which a police robot would be sent to move the object and then shoot it (to set off any explosive device in it). The term “controlled explosion” can also be applied to a more recent phenomenon, “targeted assassination,” in which a drone or helicopter targets a person who is seen as posing a terrorist threat. 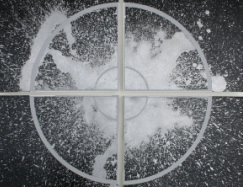 This newer phenomenon, in which the suspected person is the “ticking bomb” and the drone is the robot, is the subject of one of the works in the Controlled Explosions project. 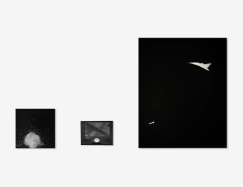 Titled Bomb’s Eye View, this triptych-like installation includes two paintings connected by a video piece. 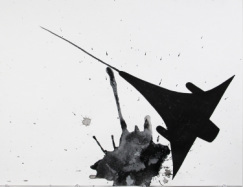 The painting on the right shows a military aircraft firing a missile. The video in the middle, which was released by the Israel Defense Forces spokesman, shows a moving car just before it is blown up by a drone’s missile. In the video, the explosion has been edited out and only the car followed by the drone’s crosshairs is shown in a loop. The “missing” explosion is relocated to the painting to the left of the video, where traces à la Jackson Pollock’s action painting, of my own “explosion” on the canvas became a representation of an actual explosion that occurred in the outside/”real” world, on a road in the Gaza Strip. The technological, occasionally “cold” look of the Controlled Explosions body of work also has biographical, personal roots. My father, who passed away when I was four years old, worked as an engineer for Rafael, Israel’s Armament Development Authority. Inspired by his profession and his background as an artist, in this project I fused my art with my fantasy of army engineering. Through my use of silver paint or leaf, some of the works take a step closer to becoming pieces of technology themselves, as silver is the color most associated with technological products. 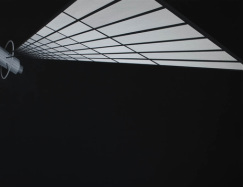 Nevertheless, the work questions and criticizes militarism and technology. 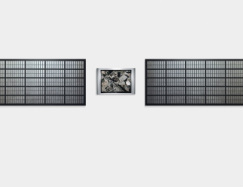 In Aim TV, for example, video and paintings are put together in another triptych-like installation: two narrow paintings of satellite wings hang from either side of a video monitor. The video offers a bird’s-eye tour of politically charged places in the world (recorded from Google Earth). Crosshairs superimposed on the urban and rural landscapes disturb the pastoral aerial glide and serve as a constant reminder of the potential and most frequent use of this technology.